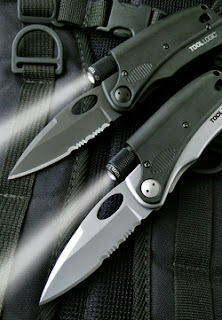 The SL Pro is a folding knife including a flashlight and an emergency whistle. The knife has a 3'' blade made of 420J2 Stainless steel with a bead blast finish or a black titanium oxide coating. The blade is 50 percent straight and 50 percent serrated to make it more functional, it cuts well and can be easily opened with one hand using the thumbhole. When opened it locks in place using a framelock mechanism. The knife handle is made of Zytel plastic and incorporates at the end an emergency signal whistle that is not as strong as ad-hoc emergency whistles but certainly enough to get attention. The top of the handle has a holder for a LED flashlight, the flashlight is interesting because it can be removed from the knife and there are several options for the opposite end of the flashlight, you can get it with a magnetic rotative swivel, you can get it with a firesteel firestarter, a cuff key and other interesting options. We assume you will be able to buy a sepparate flashlight with a different end and use the one you prefer as a modular system. The version we tested came with the magnetic swivel end that you can use to attach the light to any metallic object and use it as a task light. The tool comes with a pocket clip for pocket carry and a lanyard hole. Neither the knife, the whistle or the flashlight are the best in each category but they work well and we liked the combination of a knife a light and a whistle in a small folding pocketable knife. You can read more information and get it for $60 from Tool Logic's website. 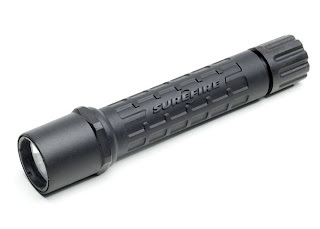 The G3 is a 3 cell version of the popular G2 from surefire. The light is an icandescent flashlight using a high pressure Xenon bulb powered by 3 123 lithium batteries. The body is a special polymer called "Nitrolon". 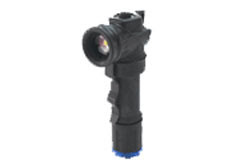 The G3 use of 3 cells allows the use of two of the 9volt Xenon bulbs from Surefire: the P90 and P91. With the P90 installed the light will produce 100 lumen for about 60 minutes. With the high-intensity (Sold sepparately) P91 bulb you will have 200 lumen for about 20 minutes. The bulbs will last aproximately 20 hours of operation (get a spare!). The 3 cell body takes the G3 to a total of 6.5 inches in lenght. The polymer body is very strong and will resist drops and hits, being plastic it won't get frozen if used in very low temperature areas. The lens is pyrex glass. The beam is a very long throw beam typical of incandescent bulbs with enough sidespill to illuminate a room. Both the 100 and 200 lumen bulbs can be used to disorient a potential attacker at night. The difference between 100 and 200 lumen is not linear so to your eyes you won't get double amount of light. From our tests the 100 lumen bulb is the best option. The switch is a lockout tailcap switch you can either twist until constant on or untwist a little and use the tailcap button for momentary operation, if you untwist a couple of turns the light will be locked for transportation the button being unable to turn it on. The G3 is a very powerful 9v light that due to the polymer body is affordable and yet keeping the excelent construction and support from Surefire. A very good adition to the incandescent series of Surefire lights. You can read more at Surefire's website or order for $60. The P91 bulb can be ordered for $27. 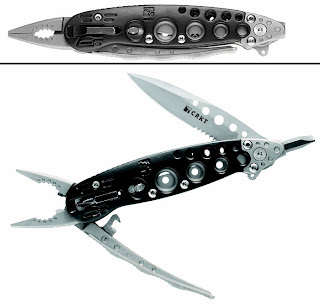 The Zilla is a futuristic multi-tool from CRKT. It is a combination of pliers, knife and screwdriver with a clip for pocket carry. The pliers are spring loaded, one of the handles being released from the body, they have the classic wire cutter in the middle and are shaped like think needle nose pliers. Operation was good but the different sizes in the handles make leverage not as good as in the other more typical multi tools, for small precision jobs the spring loaded mechanism is very good. The knife is opened using a flipper at the opposite end of the pliers, once opened it locks in place using a liner lock mechanism and the flipper acts as a guard for your finger. The knife was fine for most cutting jobs but it is probably not suitable if you need to use force with it. The grip of the knife was a little ackward since the tool's body is not wide enough. The screwdriver is an hex bit driver located at the opposite extreme of the pliers, it can take any standard hex bit, the tool has room for 2 bits in its body which is a good thing to have. The driver was by far the best part of this tool with very good torque since the whole body of the tool can be used for leverage, even the pliers handle can be used with some care to take out some rebel screws. The pocket clip is strong but maybe not long enough and the pliers end will be visible outside of the pocket, the clip can be removed if it doesn't work for you and you prefer to use the included nylon sheath. The zilla is a nice looking tool with a very good screwdriver, an interesting set of spring loaded pliers and a regular knife, if you use often this 3 tools it can be a good tool for you. You can read more and order for $40 from CRKT's website. The MOLLE light by Pentagonlight is a modernized and miniaturized version of the classic anglehead flashlight used in the army. This version is only 3.4'' long (86mm) and weights 1.05 oz (42gr), it uses a single AA battery to power a 0.5watt Luxeon LED. At the bottom of the light you will find room to attach a filter and the light comes with a red filter in the Tan version or a blue filter in the black version (pictured). The light is operated by a switch at the top, just on/off operation is available, a low level mode and a strobe or SOS mode would have been in our opinion a needed and practical addition. With a single AA battery the light will run for aproximately 3 hours. The clip is MOLLE style compatible and can be rotated so you can attach the light to a MOLLE attachment point or any regular strap or a belt, in general the clip is strong and the light is easy to both attach and remove for operation. This light has a very small size and a nice design to be used as a handsfree light attached to your backpack or a belt. You can read more information from Pentagonlight website. Price is around $30 from several dealers. The 7 hook is a tool designed for emergency situations that can be used for general purposes due to the low profile of the tool and how it can be carried. It is basically a hook knife with a elongated handle, the handle is covered in black PVC and the tool is made of 440C stainless steel. The hook at the end is very sharp and can be used to cut seatbelts, clothes, nets, cord and rope. 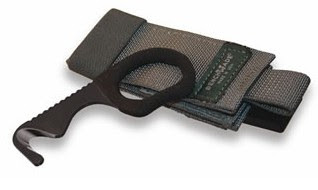 The tool comes with a nylon sheath so it can easily be strapped to a vest or a backpack and be ready to be used when needed, besides the emergency uses we found the tool very practical to cut rope and cord while camping or hiking without the need to use a blade, we didn't test it with seatbelts but there should be no problem at all. The tool is 4.30'' long and weights 1.6oz. Being made of a single piece of steel there are no weak points that can break and there is no sharp edge besides the hook to avoid cutting yourself in an emergency. Using the tool is simple, the grip is very good with knurling at the top and a good ergonomic handle. The 7 hook is a very safe emergency tool that can become a low profile general purpose cutting hook in many situations. You can order for $40 from Benchmade, with a choice of 3 colors for the Sheath. 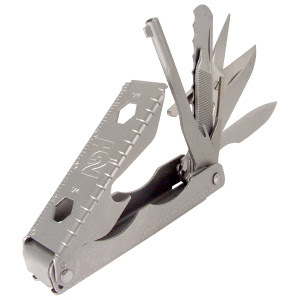 The ASP T2 tool is a small keychain multi tool with a size similar of a leatherman micra. It features a serrated edge saw, a plain razor edge, a file with a flat screwdriver end, a key for handcuffs, a seat belt cutter, scissors with plain edges, quad key, frame scale, bottle opener and pliers. The tool is just about 2 inches long and can be used in a keychain without being a bulky item. The scissors have very short handles but cut very well, he other tools are good for their purpose as long as you don't use excessive force. The mini serrated edge worked nicely and the plain edge razor was very sharp without sharpening, the cuff key is probably for those that may need it, a philips screwdriver or something more day to day practical would have been a lot better to us. A good combination of practical tools in a very small packager, probably not a good idea for people with big hands but if you like a small set of tools unnoticed in your keychain this is a nice option. You can order for $10 from this website. The Illumitacks are similar to LED blinkies used in parties and for fun. The difference being the stronger construction of the Illumitacks and that they don't blink. The 'tacks use a small green LED powered by a CR927 coin cell battery, twist the body and the light will turn on, untwist and off it goes. 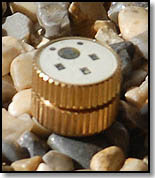 There is a very strong magnet at the bottom that can be used to attach this little devices to any metallic surface. Feeder lights are used in hunting, you can attach the illumitack magnetic LED. feeder lights to your corn feeders barrel, timer control unit, feeder legs or on leaves or twigs above baited area and have the most economical and convenient hog hunting light on the market today. The green light won't spook game according to the manufacturer. Besides hunting the lights can be used to mark trails or locations at night, each light uses two CR927 batteries and runs for about 50 hours with one set, the lights are not regulated so they will get dim as the batteries are used. After 24 hours they are still very visible, the green color is an excellent choice for trail marking since it is the color that human eyes see better. In our tests the lights were still visible after 48 hours from 100 yards, so they are quite good to mark locations if you need to hike back at night. The 'tacks are sold for $24.95 in a package of 10 including replacement batteries. You can order and read more about them from the Official Website. Brought to fame for being Jack Bauer's monocular in TV series 24 the Brunton Echo Pocket scope is a nice compact monocular for EDC carry. 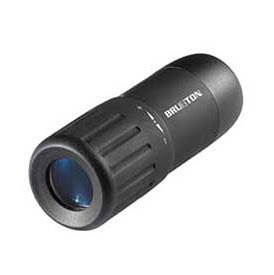 The monocular is only 3.3'' long and the diameter is only 1.3'', it weights just 1.8oz. The exit pupil is 2.6mm and it has a nice 181 ft field of view at 1000 yards. It can focus in objects as near as 1 feet and as far as thousands of yards. The optics are multi-coated the construction makes the focusing easy, just rotate the bezel while holding the monocular with the other hand, it turns smoothly so you can get the focus you need for what you are viewing. The Echo has a very nice field of view and the opctics maginification works very well, the small aperture means the total light reflected will not be a lot so this is ideal for day activities and will not perform very well after the sun goes down. For its size the Echo is really pocketable and comes with a neck lanyard and a pouch, it is very practical to hang from a backpack or slide into a pocket to be used when needed in hiking, golf, reading signs or why not espionage, after all it is Jack's Bauer monococular. The construction is strong so unless something hits the lens badly it will be fine for use outside without a lot of care. You can read more and order for $30 from Brunton.